Upon the release of the latest iteration of the iPhone, the New York Times shared what they called “a (slightly) tongue- in-cheek look at all the things this ubiquitous gadget has laid to waste.” Forgive me for sounding like a company man but I don’t see the downside in losing the things we have allegedly lost. This is the way the world has always been. So what are some of the things the Times would have us lament losing? Alarm clocks, cameras, calendars, compasses, address books, photo albums… Have we really lost these things? We still have them, they’re just on our phones! Seriously, who reading this would rather walk around carrying a camera, an address book, an MP3 player (or a Walkman! ), a GPS, a pedometer, a book, a newspaper, etc., etc. etc. plus an old-style flip phone? Why would anyone opt for all that baggage when there’s an app for that? And did anyone ever walk around carrying their photo albums? With my iPhone I can show you pictures of my trip to London or photos I took at Ground Zero on 9/11 in an instant (assuming you’re interested). I can upload, download, save and share photos with the touch of a virtual button. The functionality far exceeds that of taking my rolls of 110 film to the Fotomat. Who wouldn’t prefer all this ease? You know who wouldn’t prefer all that ease? The people who make cameras, alarm clocks and all those other things being rendered obsolete. As with 45s and pop music, the onus of adapting is on the people in the affected industries. This has always been the case. Timex had to adapt to digital watches. Kodak had to adapt to digital cameras. Cracked magazine has become a YouTube channel. Western Union now pays bills and transfers money instead of delivering telegrams. Companies that made buggy whips have disappeared. Milkmen and ice men are obsolete. This is the nature of industry. New technologies change the landscape; companies must evolve or die. Admittedly, some of the losses the Times enumerates are of an intangible nature. One of these is small talk, illustrated by two women in an elevator checking their phones rather than engaging in meaningless chit-chat. Does anyone really like those awkward, pointless encounters? Who would want to preserve them? Besides, our phones were made for small talk! Have you seen Facebook, Instagram, Twitter, et al.? All we do is make small talk – at will – with everyone from old high school friends to politicians and celebrities! Similarly, do we really want to retain the old way of hailing cabs? You can stand in the rain at 42nd and Seventh if you like; I’ll use my Uber app to get a ride. Now granted, the loss of work/life balance seems significant but did the phone really create, or even exacerbate, the problem? There have always been workaholics and maintaining a work/life balance has always been a challenge. Speaking anecdotally from personal experience, I spent many years working until 8:00 or later, routinely getting home after 9:00. Thanks to technology, I work just as much but I’m much better able to have a life, being able to work on my commute or from my home. I can’t be the only one whose work/life balance has benefitted. I’m not suggesting that there are no downsides. Every technology has downsides. Let’s take the automobile, another technology that was initially derided (“Get a horse!”). In 2015, there were 35,092 traffic-related deaths (up from 26 such deaths in 1899). There is no greater downside than death. Does anyone suggest that we should do away with cars? Who reading this refuses to ride in a car? It is universally accepted that the benefits more than outweigh the risks. There are those who would cite religious objections to new technology based on the dictum that chadash asur min haTorah – innovation is prohibited by the Torah. These people either don’t know or are willfully ignoring that this statement of the Chasam Sofer is not a halachic ruling, it’s clever wordplay that he used to express his objection to a very particular innovation. (It actually refers to chadash produce, the new crop before the Omer offering is brought.) An actual Torah perspective is ein kol chadash tachas hashamesh, there’s nothing new under the sun (Koheles 1:9). There’s nothing going on with smartphones that hasn’t gone on before with TV, radio, the telephone, moveable type or writing itself. If you think smartphones represent a threat to health, safety or society as we know it, you don’t have to carry one. 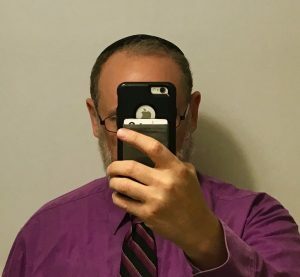 As for me, I will continue to carry a 4½-ounce device that plays music, takes pictures, counts my steps, hails a cab, keeps me in touch with people and provides me with instant access to all the world’s accumulated knowledge, including quotes from The Phaedrus, traffic statistics from 1899, and vast troves of Torah knowledge the likes of which no previous generation could enjoy. End of the day, I’m calling it a win.